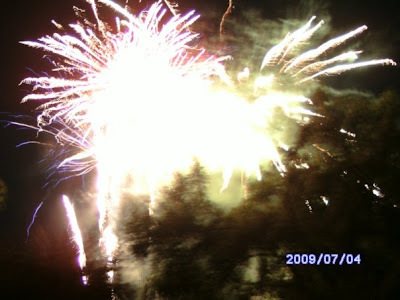 July 4 Fireworks Show a Success! Approximately 250 people gathered to watch our fireworks at Dycusburg for a show lasting about 1 hour and 15 minutes! 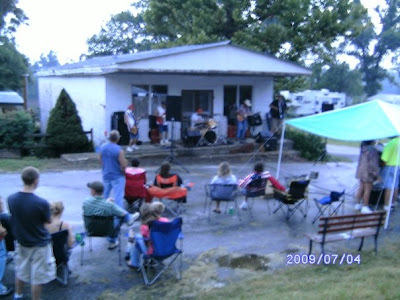 We were also fortunate to have a live band that played for about 2 hours before the fireworks and 1 hour after. This completely community supported day was started by Dycusburg Grocery in 2005, sponsored by the grocery and residents of Dycusburg who pitch in to help out. It is a tradition we plan to continue every year as long as the community and the people help us raise the money to put on such a fun day! We would like to extend a special thanks to our sponsors: Henry and Henry Monuments, Bobby Stinnett's Used Cars, Just-a-Burger, Fred Brown, Wayne Agent, Mike Cherry and all of the generous others who donated money, bought raffle tickets or otherwise made our wonderful day possible. We'll see you next year! Clara Oakley, 81, of Princeton died at 6:40 a.m., Saturday, June 6, 2009 at Caldwell County Hospital. She was retired with 29 years service as a practical nurse for Dr. Kenneth L. Barnes in Princeton. Oakley was a member of Second Baptist Church in Princeton. Suvivors include her husband, Wes Oakley; a son, John R. Teer of Princeton; a step-son, John Oakley of Benton; a brother, Vernon “Cap” Stinnett of Crittenden County; and four grandchildren. She was preceded in death by three brothers, Roy, Sammy and Percy Stinnett; a sister, Anna Patton; and by her parents, Bill Stinnett and Macie Travis Stinnett. Funeral services were Tuesday, June 9 at Lakeland Funeral Home Chapel in Eddyville with Rev. Darrell Eldridge officiating. Burial was at Dycusburg Cemetery in Dycusburg. Catherine Delores Cole, 73, of Marion died Monday, July 6, 2009 at her residence. She was a homemaker and attended Miracle Word Church in Salem. Survivors include her husband, James R. Cole of Marion; sons, Jonathan F. and wife Occie Cole of Marion and Joseph A. Cole of Louisville; a sister, Wanda Bryant, and a brother, Albert Jaggers, both of Louisville; four granddaughters, Dorreatha Stephen of Brandenberg, Ky.; Erica Houck of Bloomington, Ill.; Laura Doom of Gilbertsville, Ky., and Kelly Kinnes of Marion; and four grandsons, James and Douglas Tababen, both of Louisville, David Kinnes of Burna and Danny Kinnes of Marion; and seven great-grandchildren. She was preceded in death by her parents, Oscar Russell and Catherine Florence Gregory Jaggers. Graveside services were Thursday, July 9 at the Dycusburg Cemetery with Rev. Howard Jones officiating. Myers Funeral Home in Marion was in charge of arrangements. John G. Brown, 80, of Marion died Sunday, July 12, 2009 at Crittenden Hospital. He was a member of Calvary Baptist Church, Frances Masonic Lodge No. 580 and a veteran of the U.S. Army. Survivors include his wife, Thelma Brown of Marion; children, Bruce and wife Suzzanne Brown of Marion, Wayne and wife Joyce Brown of Eddyville and Delores Sunderland of Marion; a brother, Chester Brown of Marion; sisters, Bobbie Brasher of Marion, Betty Jean Fitzgerald of Marion and Ada Nell Peek and Cathy Nelson, both of Indiana; six grandchildren; and 10 great-grandchildren. He was preceded in death by his parents, Ross and Naomi Cox Brown and six sisters. Funeral services were Wednesday, July 15 at Gilbert Funeral Home in Marion. Burial was at Frances Cemetery. Masonic Rites were given at the funeral home Tuesday and military rites were given at the cemetery on Wednesday. Dorothy Bennett, 88, of Eddyville died Monday, July 20, 2009 at Lourdes Hospital in Paducah. She was a homemaker and a member of Dycusburg United Methodist Church. Survivors include a daughter, Sheila Endsley; a grandson, Brian Endsley of Richmond, Ky., and a great-granddaughter, Mia Katelyn Endsley of Richmond. Bennett was preceded in death by her husband of 61 years, Howard "Chick" Bennett and her mother, Harvel Edmondson. Services are at 11 a.m., Thursday, July 23 at Lakeland Funeral Home Chapel in Eddyville with Rev. Jessie Johnson officiating. Burial will be at Dycusburg Cemetery. Visitation was from 5 to 8 p.m., Wednesday at Lakeland Funeral Home in Eddyville. Dear readers and friends: This is the last edition of Southern Crittenden County News. We have enjoyed writing the column and producing community news, but other commitments mean we are unable to continue this column. Thank you to everyone who provided supportive words (and thanks, too, to those who provided criticisms, even if not always constructive). All told, we were happy to have the opportunity to write this column. To learn more about Dycusburg history and genealogy, visit www.dycusburg.com. The site is updated weekly with interesting historical tidbits about the area. Also, additional copies of "Dycusburg, Kentucky: A Glance at Her Past" will be printed late summer. To obtain a copy, e-mail matthewtpatton@yahoo.com. Donations for the "Thunder Over the River" July 4 fireworks event at Dycusburg can be made at the Dycusburg Grocery. For more information, call 988-3004. Last week's riddle was: "Paul’s height is six feet. He’s an assistant at a butcher’s shop, and wears size 9 shoes. What does he weigh?" Linda Waters and Lauren Beavers e-mailed the correct answer: "Meat." The descendants of Longshore Lamb, a Revolutionary War soldier who settled in Caldwell County near Claxton before 1810, are raising funds to erect a marker in his memory at the Lamb Cemetery. Longshore and his wife, Sarah Lee, had the following children: Mary (Polly) Lamb-Crow; William Lamb; Elizabeth Lamb-Reaves-Vaughn; Levi Lamb; Margaret (Peggy) Lamb-Farmer; Jensey Jane Lamb-Clayton; John Lamb, Sr.; Moses Lamb and Martin Lamb. Unfortunately, Longshore’s exact burial location is unknown, but a memorial marker will be erected during a ceremony on Oct. 10, 2009. If you are a Lamb descendant and would like to make a donation toward this monument, please send a check or money order to: Matthew T. Patton, 509 Onward Ave., Phoenixville, PA 19460-5932. For more information, e-mail matthewtpatton@yahoo.com. Donations have started coming in for the "Thunder Over the River" fireworks display at Dycusburg on July 4. Maybe we will have a great show after all! We will keep you posted on the progress. Keep those donations coming by sending a check or money order to: DCG, P.O. Box 112, Dycusburg, KY 42037. Donations are tax deductible. Aliyah Frutiger celebrated her 5th birthday with a party at her mother's house near Dycusburg. Several friends and family were in attendance. Making a surprise appearance was SpongeBob Squarepants. Happy third birthday to Makanda Rolfe (June 8) and to Shirley Stinnett. Happy anniversary to Dan and Michelle Henderson (June 14). Quote of the Week: "You can either give negativity power over your life or you can choose happiness instead. Take control and choose to focus on what is important in your life. Those who cannot live fully often become destroyers of life.” (Anais Nin). The answer to last week’s riddle, "how far can a dog run into the woods?" is "half way, then he’s running out of the woods." (Linda Waters, Mike Kinnis and Lauren Beavers e-mailed us last week with the correct answer). This week's riddle: Paul’s height is six feet. He’s an assistant at a butcher’s shop, and wears size 9 shoes. What does he weigh? Send your answers to dycusburg@yahoo.com. If you live in, work in, or know someone in Southern Crittenden County and would like to have something like a birthday or upcoming event mentioned in this column, please e-mail us at dycusburg@yahoo.com.